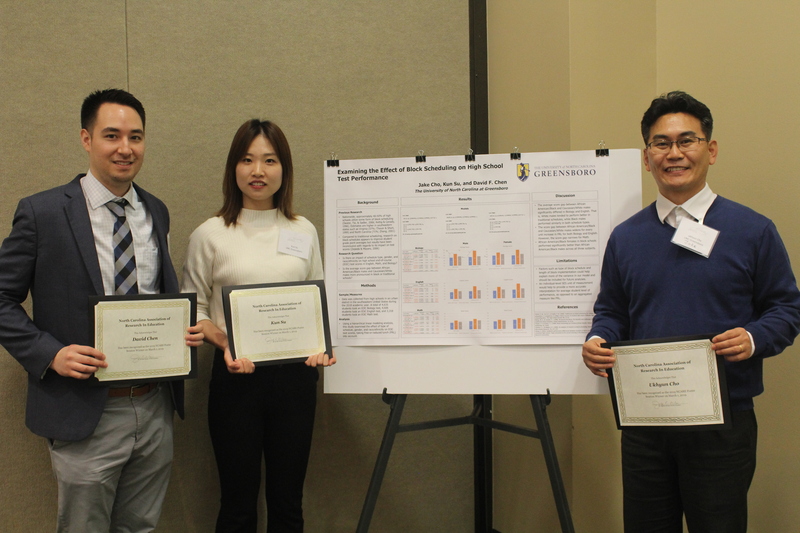 Congratulations to Uk-Hyun Cho, Kun Su, and David Chen; three PhD students in UNC Greensboro’s Educational Research Methodology (ERM) Department, and the 2019 recipients of the North Carolina Association for Research in Education (NCARE) Outstanding Student Poster Award for their project titled “Examining the Effect of Block Scheduling on High School Test Score Performance.” Inspired by their graduate assistantship supervisors, the authors applied the methods learned in their coursework to a sample of high schools in a large urban district in the southeastern United States. Their study aimed to examine the impact of scheduling (i.e., block or traditional) by using a hierarchical linear modeling (HLM) analysis. End-of-course scores in English, math, and biology were compared by type of school schedule. Learn more about the project at https://ncafrie.wildapricot.org/.